Artists Marilyn Canning and Faigie Tanner show their photo exhibits about captive sea life and the life cycle of cacti Thursday night at Perspective Gallery, 1310 Chicago Ave. The exhibits run through Oct. 27. Two photographers discussed their latest work Thursday night in Evanston, detailing how they settled on two distinct subjects: captive sea life and the life cycle of cacti. 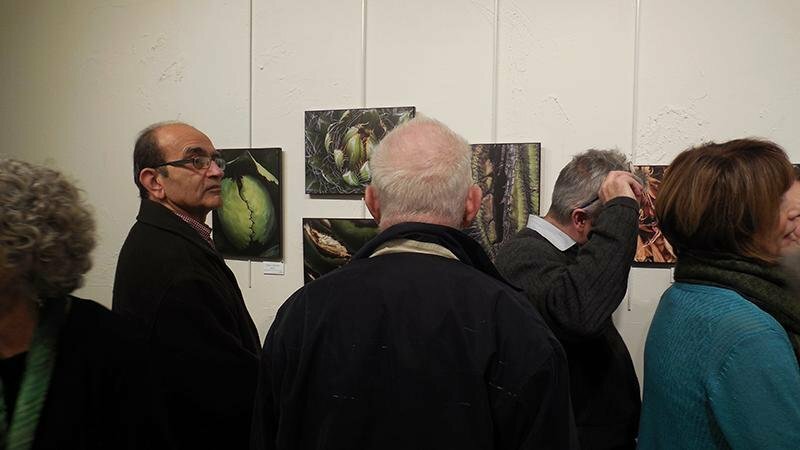 Titled “Tank Life” and “Cacti: Growth and Decay,” the exhibits are on display through Oct. 27 at Perspective Gallery, 1310 Chicago Ave.
Perspective Gallery is a non-profit, cooperative gallery with 20 members that seeks to promote photography as fine art. The members rotate their work throughout the year, with about two artists showing at a time. Marilyn Canning, who is drawn to captive sea life, said she shot at 12 aquariums worldwide for her exhibit, “Tank Life,” at the gallery. Canning, a full-time photographer in Chicago, said she still does her work in a dark room. She also prefers shooting the natural world instead of staged environments. Faigie Tanner, an Evanston artist, worked on her project for four years. Her journey began in a desert landscape in Tucson, Ariz. She has also shot in the Mexican desert. Her collection showed cacti as they evolved from life to death. Evanston photographer Bill Bridges said he enjoyed the the interaction between the photographers and their audience. “My favorite part was people responding to what they see and offering their reactions to it,” Bridges said.